When you think "Safety First"
*All 10 hour and 30 hour classes come with an OSHA card. This course covers the OSHA standards for the construction industry found in the Code of Federal Regulations (CFR) 1926 along with other relevant policies, procedures, and safety and health principles for the construction industry. Special emphasis is placed on those areas that are the most hazardous and most frequently cited by OSHA. 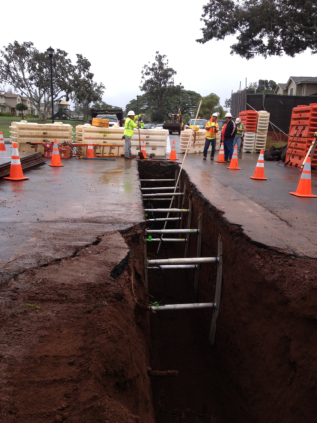 Introduction to excavation hazards and trench hazard awareness. This is an overview of excavation hazards and typical solutions to avoid issues when it comes to excavations on the jobsite. In this course, students will learn about the role and responsibility of the employer to assign a competent person to the excavation site and arm that person with the knowledge to perform the work properly. Topics include the understanding and application of definitions relating to OSHA’s Excavation Standard (Subpart P), excavation hazards and control measures, soil analysis techniques, protective system requirements and emergency response. At the conclusion of this course, the participant will understand the importance and duties of a competent person towards excavation work and will have the knowledge and skills that are required to perform duties. This course provides instruction on the OSHA standards and safety aspects of excavation and trenching. Participants learn the principles of practical soil mechanics and its relationship to the stability of shored and unshored slopes and walls of excavations. Various types of shoring (wood timbers and hydraulic) are covered, testing methods are demonstrated and an exercise is completed using instruments such as penetrometers, torvane shears and engineering rods. Introduction to confined space hazards and confined space hazard awareness. This is an overview of confined space hazards and typical solutions to avoid issues when it comes to confined spaces on the jobsite. This course will increase your knowledge of hazards associated with permit-required confined space entry. OSHA standards related to confined space entry will be covered including entry procedures, personal protective equipment, ventilation and purging requirements, calculations and techniques, and appropriate atmosphere testing equipment and related limitations. Participants will engage in hands-on training with explosion meters, oxygen meters, and other test equipment. Introduction to Scaffold hazards and scaffold hazard awareness. This is an overview of scaffold use hazards and typical solutions to avoid issues when it comes to scaffolds on the jobsite. This course provides an introduction to scaffolding hazards and will familiarize participants with the procedures, regulations, and safety standards for scaffolding. Scaffold users and safety professionals will benefit from this course by learning to control and eliminate hazards associated with scaffolding systems such as the use of frame scaffolding, rolling scaffolding, tube and clamp, system scaffolding, and suspended scaffolding. This course will familiarize participants with the procedures, regulations, and safety standards for scaffolding. Scaffold users and safety professionals will benefit from this course by learning to control and eliminate hazards associated with scaffolding systems such as the use of frame scaffolding, rolling scaffolding, tube and clamp, system scaffolding, and suspended scaffolding. Introduction to fall hazards and fall hazard awareness. An overview of fall protection hazards and typical solutions to avoid issues when it comes to falls on the jobsite. The focus of this course is to identify, evaluate, and prevent or control fall hazards at constructions sites. This course focuses on falls to a lower level not falls to the same level resulting from slips and falls. The target audience is the small construction employer, business owner, or manager who would like to obtain information about fall hazards found in the workplace. The training is also suitable for employees and employee representatives. Topics include identifying fall hazards, analyzing fall hazards, and preventing fall hazards as well as OSHA resources addressing fall hazards. This course will familiarize participants with OSHA standards regarding fall protection as well as with the latest technology, equipment and methods to protect employees from falls. Specific topics include components of fall arrest systems and the limitations of fall arrest equipment as well as an emphasis on the most hazardous situations and most frequently cited OSHA violations. This course provides a basic understanding of Heavy equipment safety on the construction worksite. The course will feature these topics: Daily pre-start inspection and operation techniques, safety in mounting/dismounting equipment, rigging and lifting with mobile construction equipment, hand signals for construction equipment, identification of hazards associated with mobile construction equipment, and how to avoid and what to do when you hit utilities. The course materials will include an instructor and student manual; workshops and group activities; and PowerPoint presentations. The course is designed as an awareness course for employers and employees. Work zones can become danger zones if traffic control is not set up properly. Preparedness – particularly training – is the key to preventing many work zone collisions. This course provides necessary training in the basics of work zone traffic control. You will learn the importance of complying with the state regulations on traffic control devices and all relative state standards which apply to state roadways including the Interstate System. A flagger is often the first line of communication between the motoring public and a street or highway work area. This course increases your awareness of the importance of the flagger’s duties and offers demonstrations of proper flagger attire, positioning and techniques. Practical exercises on common flagging situations are included. We have Associates and affiliates servicing all of the United States and beyond. Serving the Hawaiian Islands (Oahu, Maui, Hawaii, Kauai), Guam, and American Samoa. China and the Philippines. Serving Texas (Austin, Corpus Christi, Dallas, Fort Worth, Houston), Arkansas, Louisiana, New Mexico, Oklahoma, Puerto Rico and The U.S. Virgin Islands. Central and South Americas. Alabama, Alaska, Arizona, Arkansas, California, Colorado, Connecticut, Delaware, Florida, Georgia, Hawaii, Idaho, Illinois, Indiana, Iowa, Kansas, Kentucky, Louisiana, Maine, Maryland, Massachusetts, Michigan, Minnesota, Mississippi, Missouri, Montana, Nebraska, Nevada, New Hampshire, New Jersey, New Mexico, New York, North Carolina, North Dakota, Ohio, Oklahoma, Oregan, Pennsylvania, Rhode Island, South Carolina, South Dakota, Tennessee, Texas, Utah, Vermont, Virginia, Washington, West Virginia, Wisconsin, Wyoming. Guam, Puerto Rico, U.S. Virgin Islands. Australia, Belgium, Brazil, Canada, China, Germany, India, Indonesia, Japan, Malaysia, Mexico, The Netherlands, Philippines, Russia, United Kingdom.